Dr. Lawrence Lenderman was born in California. He started his private practice in San Antonio in 1985. Dr. Lenderman earned a Bachelor’s of Science in Chemistry from the University of North Carolina in 1972 followed by his Doctorate in Medicine from the Bowman Gray School of Medicine at Wake Forrest University in 1976. Dr Lenderman completed his surgical internship at Keesler AFB Regional Hospital in Biloxi, Mississippi and his orthopedic surgery residency at Wilford Hall Medical Center at Lackland AFB in San Antonio, Texas. He served in the United States Air Force and he received an honorable discharge in 1985. 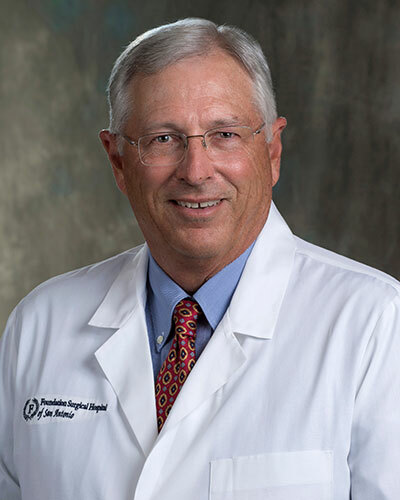 Dr. Lenderman is certified in Orthopaedic Surgery by the American Board of Orthopedic Surgery. Dr. Lenderman held staff appointments as an orthopedic surgeon at Lakenheath AFB, England (1981-84) and at Andrews AFB in Washington, D.C. (1984-85). He also served as Assistant Professor in the Department of Surgery at the Uniformed Services University Health in Bethesda, Maryland (1984-85). Dr. Lenderman is on the medical staff of Foundation Surgical Hospital of San Antonio. He has also served on the medical staff of Methodist Specialty and Transplant Hospital, Southwest Texas Methodist Hospital, St. Luke’s Baptist Hospital and Nix Hospital – all of San Antonio, Texas. Dr. Lenderman is professionally affiliated with the Bexar County Medical Society, Texas Medical Association, Texas Orthopedic Association and is a Fellow with the American Academy of Orthopaedic Surgeons. Specializing in lumbar spine, knee and shoulder surgery and fractures.